Verizon Wireless held a briefing today here in San Diego as part of MobileCON's day one festivities, citing the inroads it has made with its extensive LTE network. 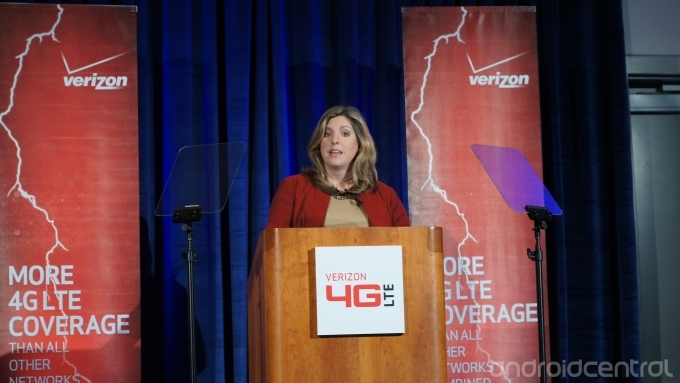 According to VZW CTO Nicola Palmer, Verizon's LTE footprint currently covers 75-percent Americans, and is scheduled to duplicate the 3G footprint by the end of 2013. At the end of September 2012, 35-percent of all of Verizon's data traffic was over its LTE network. Speaking on the future of LTE, Palmer said that Verizon will now focus on capacity, using an "entire toolbox of tools", including LTE Advanced and the carrier's recently-acquired AWS spectrum. "We are looking forward to [LTE Advanced] and we will likely pick and choose features when they become available." Palmer said that customers can expect AWS-compatible devices to hit the market sometime in 2013. Also on the horizon for 2013 is the much-awaited arrival of Voice over LTE (VoLTE), which Palmer said she has tested personally. "Putting voice on our LTE network is something we are pretty excited about. We are testing it, we have deployed all necessary infrastructure." According to Palmer, VoLTE will arrive on Big Red by the end of 2013.